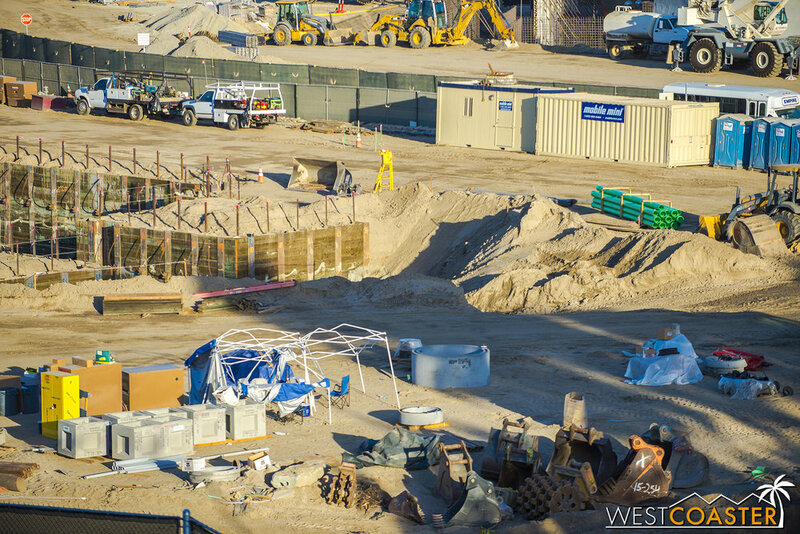 We interrupt this regularly scheduled Knott's Scary Farm update to bring you a... Disneyland Resort update. And this might be the last one for a while, because with Halloween season heating up, we'll be visiting plenty of haunts all across Southern California and posting updates from these places. And if you're wondering about what options you have, you should take a look at our 2016 Southern California Haunted Attraction Guide, which is frequently being updated as new information becomes available! Seriously. Check it out. I put a lot of hard work into it, and it's pretty good stuff. Anyway, because of all the spoopy, the Disneyland updates will be less frequent, so I figured it'd be good to post something today. 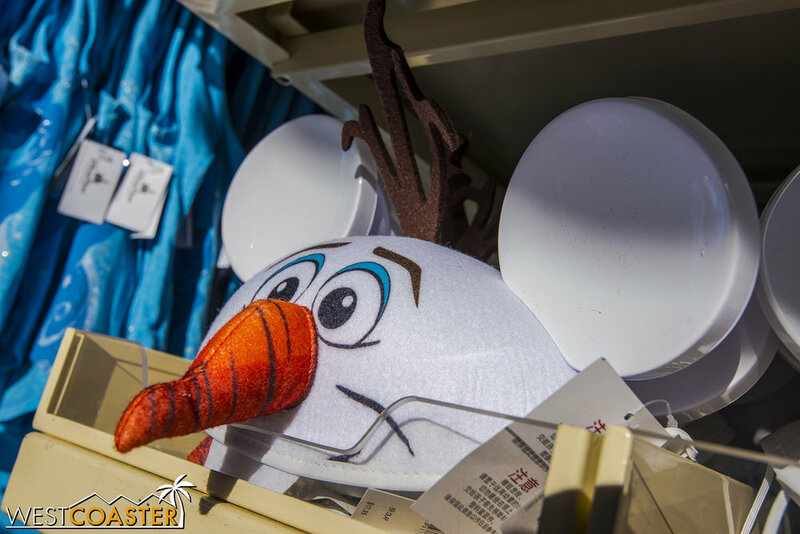 Plus, last week, something happened that sent shockwaves through the Disney fan community. Scroll down to find out what--you won't believe that you were already told what it is by this update's sub-title!! Friday parking was a bit of a mess, so I parked in Downtown Disney, since I knew my photo run would be relatively quick. This allowed me to snap a few shots of the work going on in the area. Next to the AMC Theater, a permanent Disney Vacation Club spot is being set up. Refurbishment is happening at the bridge over Disneyland Drive. Work continues on the World of Disney east entrance facade. 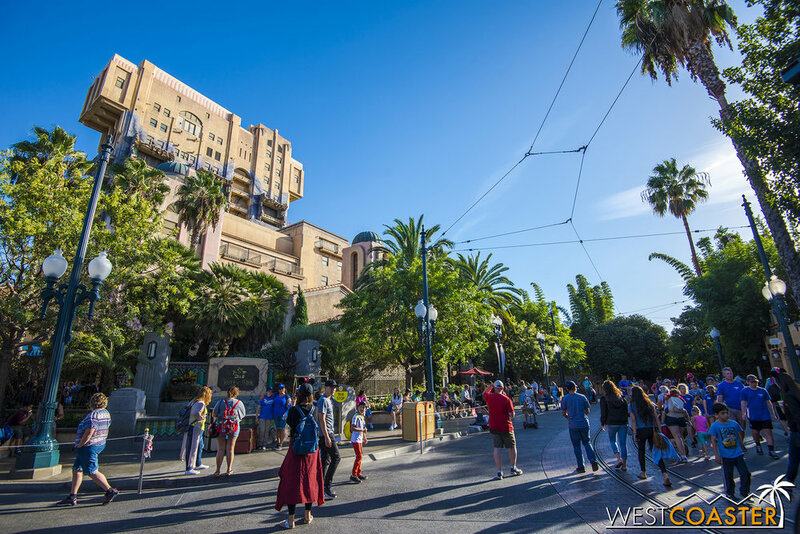 In more shocking news, a week ago, in the darkness of the night, an evil crane stole into the Disney California Adventure property and nefariously removed the "HOLLYWOOD TOWER HOTEL" signage from the iconic ride. Without so much as a warning, the ride was stripped of its identity, and its facade lade barren for all to see. Great outrage was pronounced, as commentators everywhere rushed in quickly to denounce Disney for their "bad show" and defilement of a beloved ride before it even had the dignity of being formally closed. And even more tragically, no one was apparently able to visually capture the moment when the building read "HO TOWER." Truth be told, I do think it's odd to begin work on the exterior before the ride is even closed. It makes sense when comparing the concept art to the current facade and knowing that the attraction is slated to open by the middle of next year. But it's still kind of annoying that a ride can't be properly remodeled in peace. It's a case of impossible schedule dictating less ideal construction means and methods. That said, the Tower without the signage doesn't really look terrible in my opinion. 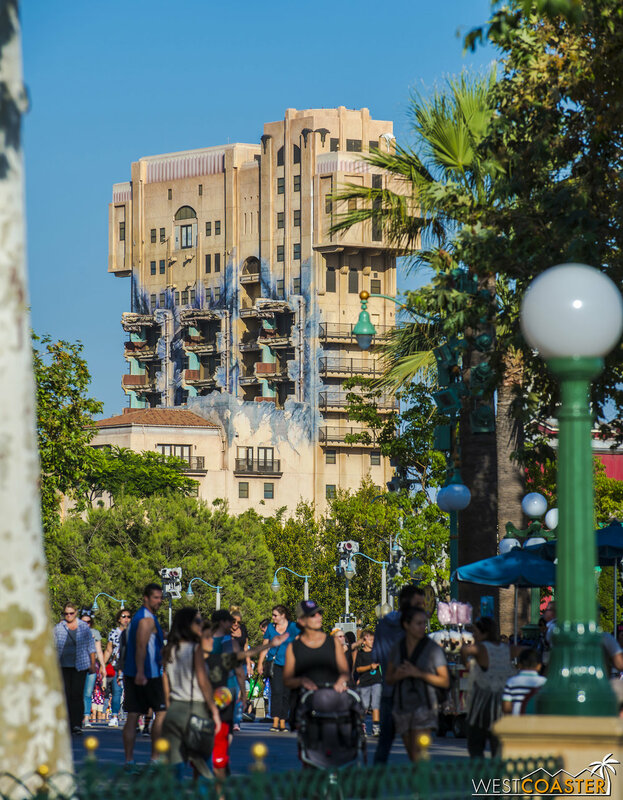 We're all used to the "Hollywood Tower of Hotel," but it's not like the building looks incomplete without the signage. Closer to ground level, a photo op has been set up for guests wanting to say goodbyes. 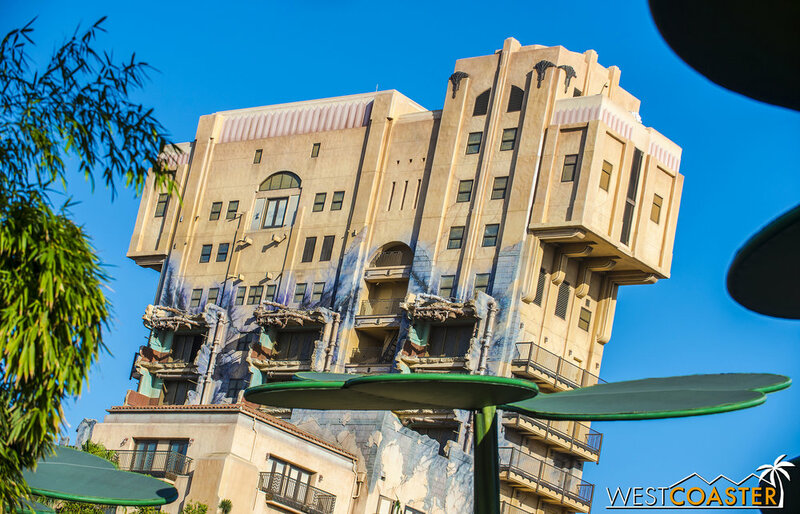 It's nicely done, though sort of bittersweet for Tower of Terror fans. Then again, it's not like there was exceptionally high praise for the ride when it first opened. 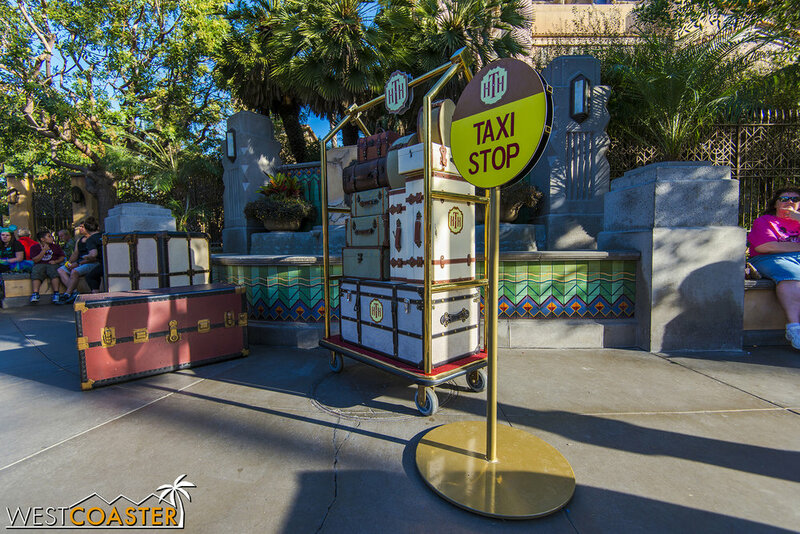 In fact, many people criticized the ride for not being as incredible as Florida's version, for having that illusion-killing service corridor between the ride carriage and queue, and for lacking randomized drop sequences. But as with many things, stick around long enough, and people develop attachment. And take away the very thing they used to criticize after they've grown attached, and you get new complaints. Whatever you think about the Guardians makeover (I'm not particularly fond of it myself, given that Hollywood Land won't be fully transformed into a Marvel themed land anytime soon, and even that eventual transformation will be eroding the re-devised story the 5-year DCA expansion project just finished setting up), the change is happening, and soon, these views will look a lot different. Here's last week's loot from AP Days. A scavenger hut, the week's AP Days pin, and recipe cards. The food demonstrations continue over in Hollywood Land. In other news, Tot-chos are still a thing, so why haven't you stuffed your faces with these?? Get them at the food truck in Hollywood Land near Monsters Inc.
And if you look over here, you will see... ABSOLUTELY NOTHING! 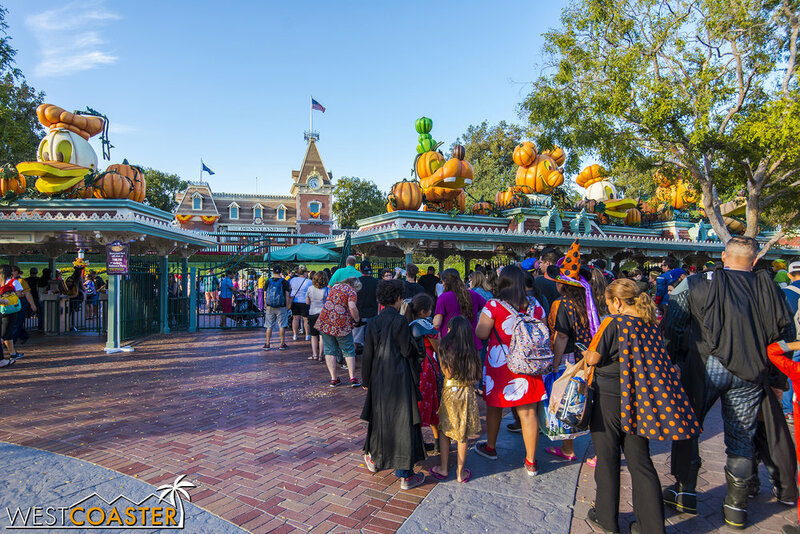 Friday marked the first day of Mickey's Halloween Party for 2016. Guests lined up in the afternoon dressed up to trick or treat and meet the villains and experience the park in costume. For those who might be worried that Disneyland's recent dress code changes might impact the event (guests 14 years and older cannot wear costumes during normal park days), fear not. The rules for the Halloween Party appear to be the same, and there were plenty of adults dressed up along with their kids. Lets take a sneak peek at the festivities, plus some random work going on in the park. Guests line up for the Halloween Party. Make sure you get here early, because it can get crowded if you don't. This year's Halloween Party map. Inside, adults can definitely be costumed. Blow-up Mickey Ghosts an only mean one thing: regular guests, your stay shall be ending prematurely as the park closes early to the public and stays open only for those with the special separate ticket. Market House has finished its little exterior facade touch-up's. Crystal Arts, however, has not. If you want to know if you can wear a costume to Mickey's Halloween Party, who you gonna call? Some paving work at the end of Main Street. Well, this is the easiest game ever. Early on, Halloween Party guests line up to get their photos taken in front of the big Mickey Pumpkin. Some are dressed up, some are not. Soon, candy and cavities will be dispensed here. 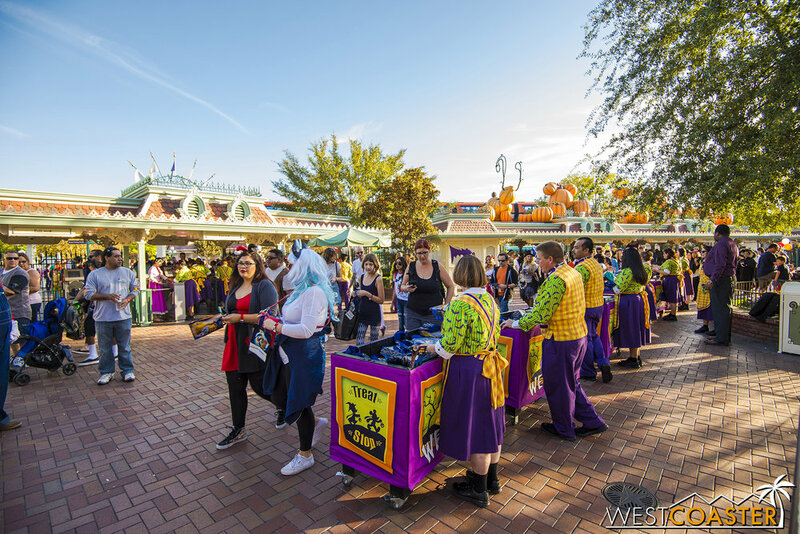 Mickey's Halloween Party goers get souvenir trick or treat bags. It's a pretty fun and cute event, and it even has a new parade this year (running twice-nightly). It may be a little pricey, but it's fun for the families! And photogs. Finally, we head up high to Mickey and Friends to check out progress in Disney's Tatooine. Work continues, as pits get deeper and more walls appear. Plus, the drained portion of the Rivers of America is starting to turn into a bit of a mess. But that's the necessity of a massive expansion and infrastructure rework. Switched it up this time and saved "Star Wars" Land for last. That way, we can't be accused of being like that band that always plays the same setlist. Anyway, here's your panorama sweep. Remember when I said get to the parks early for Mickey's Halloween Party? This is why. At 4:00pm of Friday, the parking structure was backed up out of the structure. An hour later, it looked like this, with cars backed up past Ball Road and over the express bridge as well. These earth moving machines are ruining the forced perspective of that in-progress mound! More piles and retaining walls continue to be drilled and set up. The concrete over this tunnel has cured. Someone can correct me if I'm wrong (since I don't actually have insider knowledge), but I imagine that this is future entrance into the land off the area formerly occupied by Big Thunder Ranch? The buildings continue to progress. More and more concrete. They're actually starting to become shapes and forms! Huh, some #PoopPipes running down the side of those walls there. Concrete rebar going up for additional walls. At this point, we're basically at the backside of the future Disneyland Railroad trestle over the adjusted Rivers of America. Guy Selga's regular NOODLES photo. So much concrete formwork! 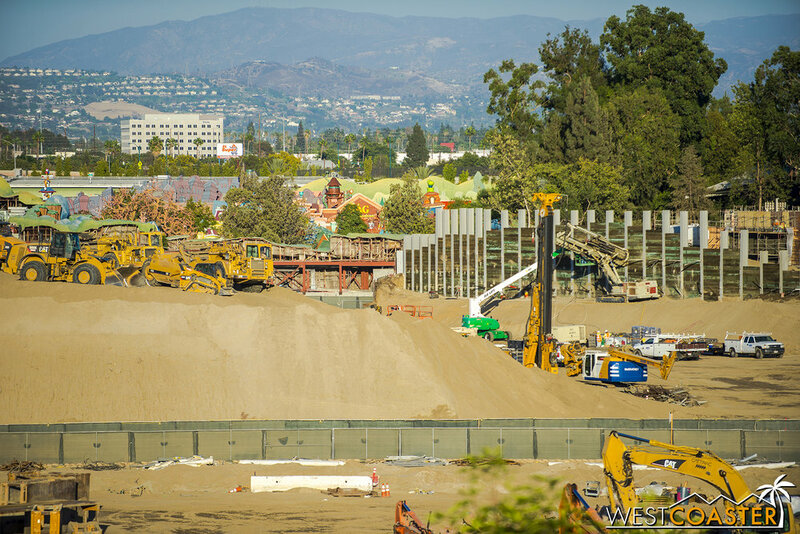 "Star Wars" Land will be stiff and ductile! And unless you're an architect or structural engineer, you probably don't appreciate that description! Just a few months ago, they were hardly digging around. Now things are in very full swing. Lets zoom back out and focus on the foreground. The sewer piping and storm drain conduits from past updates seem to have been buried now. Meanwhile, that basement being dug seeeps to be getting larger and larger. ...but that hole is about twice as deep as the last time I was here. Finally, we look over by the Hungry Bear. Stuff is scattered everywhere, but they have till next spring/summer to clean it up. We'll come back to Disneyland next month with a look at this year's Mickey's Halloween Party event. And maybe a construction update, if schedule permits. Tomorrow, it's back to fog and darkness and haunts with a look at Knott's Scary Farm's scare zones.